This new image from NASA’s Mars Reconnaissance Orbiter shows frost in gully alcoves in a crater on the Northern plains of Mars. 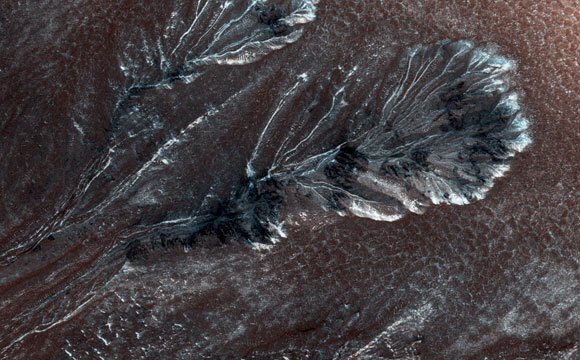 This image, acquired on April 11, 2015, by the High Resolution Imaging Science Experiment (HiRISE) camera on NASA’s Mars Reconnaissance Orbiter, shows frost in gully alcoves in a crater on the Northern plains. The frost highlights details of the alcoves, since it forms in different amounts depending on slopes and shadows as well as the type of material making up the ground. Rugged rock outcrops appear dark and shadowed, while frost highlights the upper alcove and the steepest route down the slope. 1 Comment on "New NASA Image of the Northern Plains of Mars"
looks like silver flatware or serving spoons.